It reminded me of the end of shiva. As the resident Judaism expert I told MY DAD and THE DIVA that we should take a walk to mark the conclusion of shiva. None of us really felt like doing it, but I played the “I want you to do it” card. (NB: we had a previous agreement that we would try to do everything that we could to bring comfort to all of us and that meant going along with some things for one of us). When we reached the bottom of the driveway I said, “It is traditional to go to the left.” I was kidding. We went to the left anyway. We walked around the cul-de-sac. Headed back up the driveway and went into the front door. I can’t speak for MY DAD or THE DIVA but I found this ritual empty. I was just as sad, numb, angry, confused, tired, and drained as I was when we left the house. Lighting the yartzeit candle felt very similar. 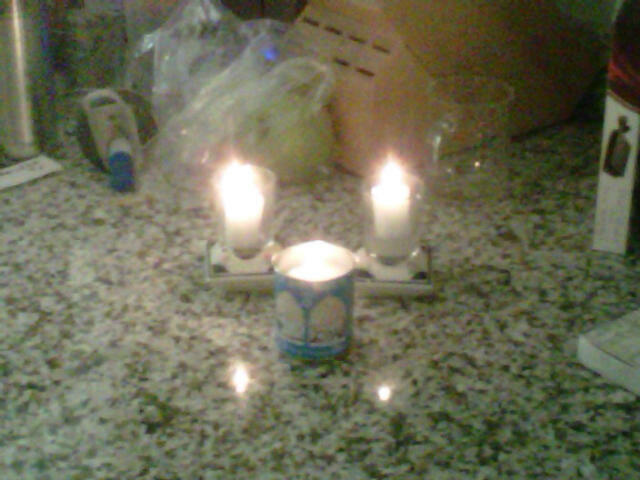 I will continue to light the candles on the days Yizkor is recited. Maybe next time will be different?